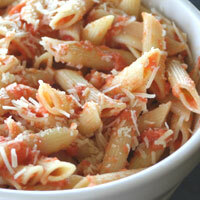 This pasta is best in the summer with garden-fresh tomatoes. 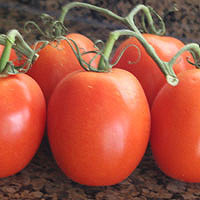 Fortunately on-the-vine tomatoes can be found all year in stores which are a great substitution. It is my family's favorite pasta especially when I add the cream! 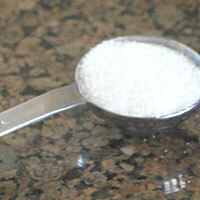 In a medium bowl prepare an ice bath by filling it half way with ice and cold water. Place them in the boiling water until the skins start to break (about 1 minute). Remove and place in ice bath to stop cooking. Cut the top out of each tomato and slip the peel off. Gently squeeze the tomatoes to discard the *seeds and *liquid. 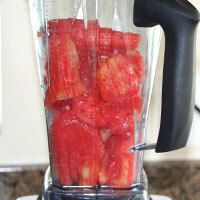 Place the tomatoes in a blender or food processor and puree to desired consistency. If there are several seeds still in the tomatoes, puree them lightly so the sauce won't turn bitter. 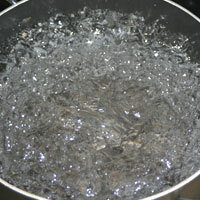 Bring a large pot of water to a boil on the highest heat setting. Meanwhile start the sauce (see below). When the water boils add the tablespoon of salt and pasta. Stir so it won't stick to the bottom. Stir every 2-3 minutes while it is boiling. The pasta generally takes 8-11 minutes. Check it by removing one piece and breaking it in half. Look at the middle of the pasta. If there is a hard center cook it longer. You want the center to be barely visible or just done. Don't overcook! Drain and return to large pot or serving bowl. While waiting for the water to boil, start the sauce. In a large skillet heat olive oil over medium-high heat until hot but not smoking. If it is smoking discard and start over. Add the garlic and cook until it just starts to brown. Again if it gets too hot, discard and start over. 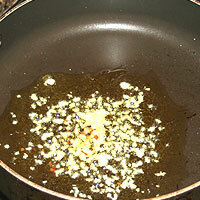 Olive oil and garlic that is too hot will make the sauce taste fried. Add the pureed tomatoes and stir completely. Add the sugar, kosher salt, and red pepper flakes. Simmer over medium heat 5-10 minutes. Do not cook longer than ten minutes. It starts to lose the fresh taste. Add the cream (if using) and heat through without boiling. Keep warm until the pasta is done. Add the sauce to the drained pasta. Stir completely. Serve immediately with fresh parmesan. 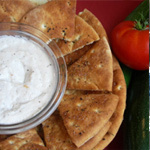 Bitter sauce: The seeds in tomatoes are bitter, so be sure to squeeze them out. 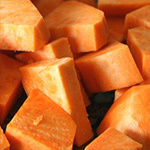 Thin sauce: If the liquid surrounding the seeds is not discarded, the sauce will lose flavor and be too thin. Burnt taste: When heating the olive oil and the garlic be sure not to over-heat them. Doing so will make the sauce taste fried. 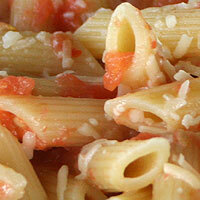 Soupy pasta: I have made this pasta with extra tomatoes. I really like the sauce, so I thought it would be great, but the extra sauce made it too soupy. Stick to the 2-3 pounds of tomatoes. 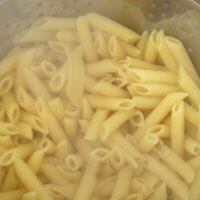 Mushy pasta: Cook the pasta until just done (al dente). Overcooking it makes mushy pasta. Also, drain immediately when it is done to stop cooking. 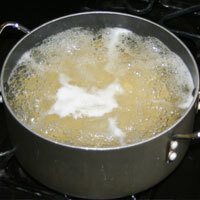 Boil water in a saucepan. 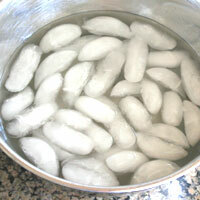 In a medium bowl prepare an ice bath by filling it half way with ice and cold water. Wash the tomatoes. 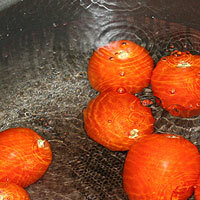 Place them in the boiling water until the skins start to break (about 1 minute). Remove and place in ice bath to stop cooking. 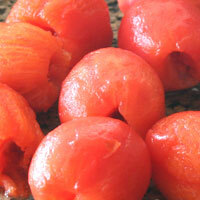 Cut the top out of each tomato and slip the peel off. 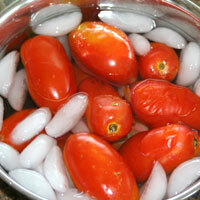 Gently squeeze the tomatoes to discard the *seeds and *liquid. 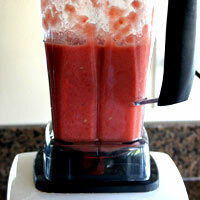 Place the tomatoes in a blender or food processor and puree to desired consistency. If there are several seeds left in the tomatoes puree lightly so the sauce isn't bitter. When the water boils add the tablespoon of salt and pasta. Stir so it won't stick to the bottom. Stir every 2-3 minutes while it is boiling. The pasta generally takes 8-11 minutes. Check it by removing one piece and breaking it in half. Look at the middle of the pasta. If there is a hard center cook it longer. You want the center to be barely visible or just done. Don't overcook! Drain and return to the large pot. While you waiting for the water to boil, start the sauce. In a large skillet heat olive oil over medium-high heat until hot but not smoking. If it's too hot discard and start over. Add the garlic and cook until it just starts to brown. Again if it gets too hot, discard and start over. Olive oil and garlic that is too hot will make the sauce taste fried. 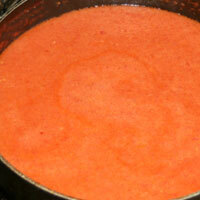 Add the pureed tomatoes and stir completely. Add the sugar, kosher salt, and red pepper flakes. Simmer over medium heat 5-10 minutes. 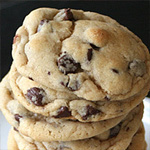 Do not cook longer than ten minutes. It starts to lose the fresh taste. Add the cream (if using) and heat through, but don't boil. Keep warm until the pasta is done. 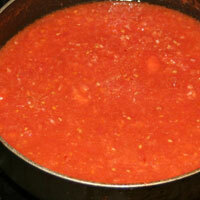 *Discarding seeds and the surrounding liquid are important when making tomato sauces. 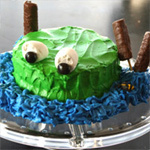 The liquid adds a lot of water that breaks down slowly and takes time to steam off. It also doesn't add much flavor. The seeds are bitter, so are desirable to discard, especially if you are going to puree the tomatoes. Pureeing the seeds releases makes it even more bitter.